Wrong, Democrats: There Was No FBI "Cover Up." They Played It By The Book. Frustrated that the bureau hasn’t helped them bring down a nomination they otherwise oppose, Democrats have pivoted to attacking the FBI — specifically, claiming that the inquiry was curtailed to prejudice the outcome by limiting the pool of interviewees. They’re wrong: The FBI followed procedure precisely. Indeed, the FBI followed the standard background investigation process the Senate uses for the hundreds of nominations it considers. And it’s exactly the process that Democrats were demanding only days ago...In rare cases, information or allegations arise after the file is complete. When this happens, the FBI may be asked to conduct an additional, supplemental investigation, narrowly targeted to those matters. That’s what the Senate requested and that’s what it got with respect to recent allegations against Kavanaugh. This supplemental investigation adds to an already thick file. The FBI has now conducted six thorough investigations of Judge Kavanaugh, both in connection with his nomination to the Supreme Court and in prior government service. All of those investigations demonstrated the judge’s character and fitness...Democrats now portray the FBI supplementary investigation, which followed standard procedures they deemed essential just days ago, as a mere smokescreen...This spin can be explained in only one of two ways: Either Senate Democrats piously demanding an FBI investigation had no understanding of what such an investigation entails or, much more likely, they have been cynically playing for delays all along. My admonition from the other day about uncorroborated allegations that confirm your priors remains firmly in place, but it's...quite interesting that the woman who purports to back up Ford's denial of her longtime boyfriend's assertions about polygraph coaching is the very same woman who apparently texted Leland Keyser to urge her to alter her original public statement. That original statement both failed to corroborate Ford's recollection of the party, and went further to say that Keyser didn't know Kavanaugh. That's effectively a form of witness tampering, and it may be the only real piece of news to come out of the FBI's latest work on this matter (and for the record, I think we should see that report, with limited redactions, as necessary). Relatedly, check out the deeply-connected DC Democratic lawyers who are involved in this mess, and recall that while Sen. Feinstein was doing nothing on Ford's allegations vis-a-vis the committee and Kavanaugh, she was connecting Ford with partisan lawyers. I'm not sure any of this proves a conspiracy or malicious impropriety, but the stench of impropriety is thick. 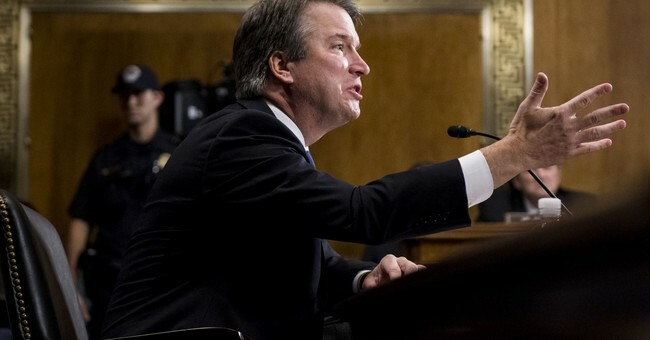 One more stray thought, via a friend: There is now literally more contemporaneous and current evidence bolstering Kavanaugh's testimony that "the Devil's triangle" reference in his high school yearbook entry was about a drinking game than there is to support either of the actual allegations against Kavanaugh. Think about that.